The draw for the qualification tournament for the World Cup in Brazil in 2014 was made on Saturday 30 July. The Faroe Islands were drawn in Group C together with Germany, Sweden, Ireland, Austria and Kazakhstan. The Faroes have met all these teams previously, but not all of them in qualifiers. Let’s take a look at the teams. We’ll begin from the bottom. The UEFA ranking refers to UEFA’s “Interim National Team Coefficients” published in June 2011. As the Faroes had moved up to the second lowest seeding-pot this time, the hope was to get one of the weakest countries from the bottom group, i.e. Liechtenstein, Luxembourg, Malta, Andorra or San Marino. The hope was also to avoid Wales and Iceland. In the end, the result was something in the middle: Kazakhstan. As the last of the Soviet republics, Kazakhstan gained independence in 1992 and were soon accepted as members of FIFA. Having been part of the Asian Football Confederation in their early years after independence, Kazakhstan instead switched to UEFA membership in 2002. 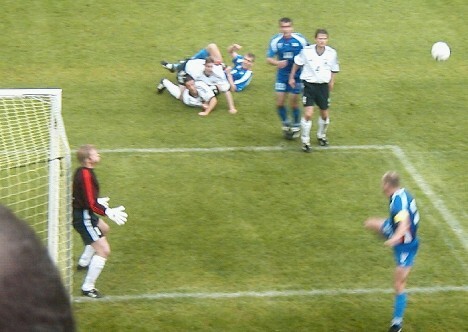 Kazakhstan played two friendlies against the Faroe Islands in 2003 which the Faroes won 3-2 (Svangaskarð, 27 April) and 2-1 (Tórsvøllur, 29 April). Based on that, there will certainly be hopes for Faroese points in these two fixtures; especially at home. According to Kazakhstan’s results in the current qualifying round for EURO 2012, they haven’t improved much since 2003 and their group results are quite similar to those of the Faroe Islands; typically losing by 2-3 goals. They have recorded one win against Azerbaijan. Interestingly, they are grouped with Germany and Austria, who all three will be in the Faroe-group next time. The players of Kazakhstan’s national team predominately ply their trade in their home country. Once again the Faroe Islands have been paired with Austria. – You could argue that that’s where modern Faroese football history begins; with the 1-0 win over Austrian in 1990 in the Faroe’s 1st ever competitive international. But the Faroes teased Austria once again in 2008 with a 1-1 draw at home. So there’s no reason not to believe in more points against the Austrians. They will certainly fear it and feel the pressure of possible more humiliation. Ireland is the 3rd seeded team in the group. Interestingly, current Faroese coach Brian Kerr was the Irish manager when they faced the Faroe Islands in the qualification tournament for the 2006 World Cup. In the match at Tórsvøllur Ireland had to fight hard for the 3 points in a 2-0 win. If Ireland could be pressured in 2005, they can bee again in the next qualifying campaign as well, so a point at home is not just fantasy. – But much would have to go right for the Faroese team, however. The Faroe Islands have never met Sweden in a competitive international before, but have met in an indoor friendly in Sweden in 2001 where Sweden had fielded a team with domestic players only. The result was 0-0. As a curiosum, it could be mentioned that Zlatan Ibrahimović made his debut for Sweden in that match. (The match was officially a match in a Nordic competition which lasted for a couple of years before the idea was dropped again. But it can be treated as a friendly international). For the second time, the Faroes have been grouped with Germany. It brings back mixed memories it was so extremely close for a sensational Faroese draw both at home an away. At home the Faroes held Germany for more than 88 minutes who then scored twice to tear apart Faroese hearts and in the away fixture the Faroes hit post-out for what could have been a 2-2 draw in the dying moments. But if it could (almost) be done then, why not again…? Faroe Islands: current FIFA ranking: No. 112 / UEFA ranking: No. 49.